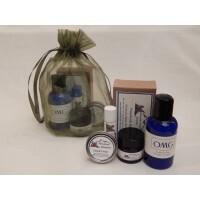 This is a perfect way to try our OMG products or give as a gift to a friend! OMG Under Eye Creme This crème is a combination of OMG Daily Treatment proprietary essential oils, organic Aloe, organ..
OMG Time Defy Creme A light weight crème packed with regenerative, anti-aging, nourishing, and anti-oxidant ingredient..
OMG Aloe Vera Creme I almost named this “Oh my God this is fantastic!” but it didn’t fit on the jar. It’s a mois..
Sampler Gift Bag A gift bag containing sample sizes of some of our favorite products in a beautiful organza drawl str..